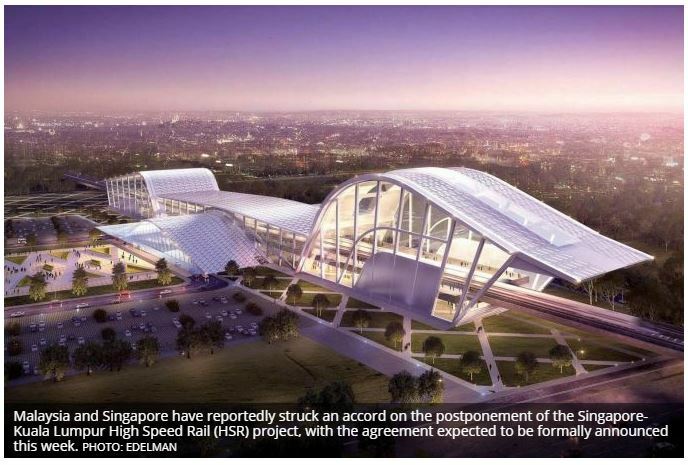 [KUALA LUMPUR] Malaysia and Singapore have reportedly struck an accord on the postponement of the Singapore-Kuala Lumpur High Speed Rail (HSR) project, with the agreement expected to be formally announced this week. The compromise, reached “in a spirit of good neighbourliness”, will see Malaysia being spared having to pay a RM500 million (S$168 million) penalty for postponing the project, reported The Edge in its Sept 3 issue, citing sources. According to the business publication, the 350km link will be deferred for two years until May 31, 2020. Last Thursday (Aug 30), Singapore’s Minister for Transport Khaw Boon Wan said on Facebook that he had met Malaysia’s Economic Affairs Minister Azmin Ali and they were “brainstorming ideas on how to further our bilateral relationship”. “We should be able to announce our joint decisions on RTS and HSR soon,” added Mr Khaw, who is also Coordinating Minister for Infrastructure, referring to the Johor Baru-Singapore Rapid Transit System. Datuk Seri Azmin had also referred to the meeting on Facebook and said the countries were “inching closer to a win-win deal on HSR”. Malaysian Prime Minister Mahathir Mohamad had announced in May that the newly elected Pakatan Harapan government wanted to scrap the rail line between the two cities, which was originally slated for completion in 2026. Malaysia later softened its stance, saying it would negotiate with Singapore and seek a deferment on the project. Kuala Lumpur estimates the project would cost it RM110 billion, an expenditure it claims it can ill afford as it tackles RM1 trillion in national debt. The source told The Edge that Singapore recognised the strain the project’s construction could have on Malaysia’s financial health. Mr Khaw revealed in Parliament in July that Singapore had already spent more than S$250 million on the HSR project, and is likely to expend another S$40 million by the year end. According to The Edge, the original deal to build the HSR, which was signed in 2016, did not contain provisions for a postponement. Malaysia would have faced up to RM500 million in penalties, had it decided to terminate the project in breach of the agreement, said the report. The rail link was expected to cut travel time between the two cities from four hours by car currently to 90 minutes. The line was to have eight stations: the Jurong East station in Singapore, and on the Malaysian side, Bandar Malaysia, Sepang-Putrajaya, Seremban, Melaka, Muar, Batu Pahat and Iskandar Puteri stations.